Talk About Records is proud to present the new KING HOWL EUROPEAN TOUR, scheduled from March 15th till March 24th in different cities of Germany, Belgium, Netherlands and the Czech Republic. 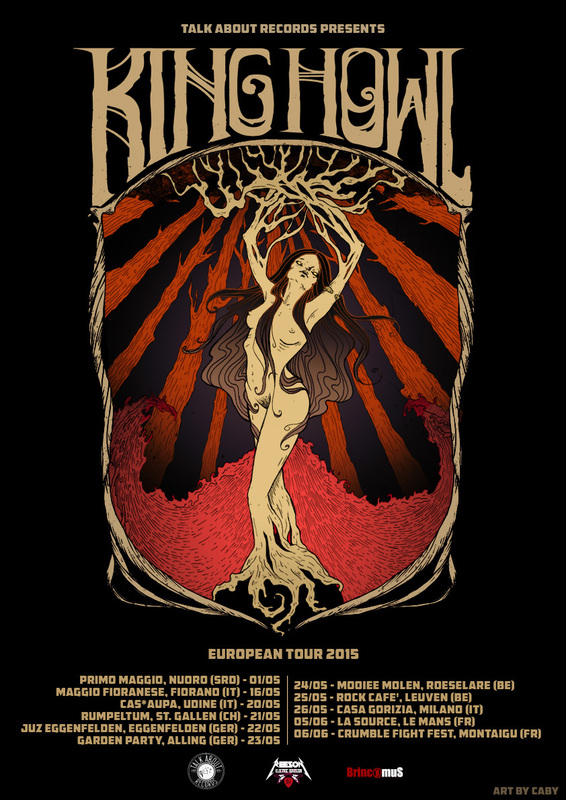 After the release of the acclaimed third album “Rougarou” in the summer of 2017, the heavy blues combo from Sardinia is now ready for its fourth European Tour, that will be comprised of nine club shows plus a special radio appearance for the Berlin’s Radio Alex.Four countries, ten days, ten shows. Tour was made possible thanks to the collaboration between Talk About Records and Agitoriu Booking, and is supported by Reeson Electric Division and Electric Valley Records. Tour poster made by Elena Cabitza. KING HOWL AT SWANFLIGHT 2016! We are the headliner of Swanflight Festival 2016, scheduled for the 11/03/15 in Schwandorf, Germany. We will share the stage with The Sonic Dawn (DNK) and The Heavy Minds (A). Below you can have a look at the stunning poster made by CABY. See you in Bavaria! Here’s the new videoclip for “Kerouac”, new single from our last work “Truck Stop Ep”. Filmed by King Howl & Agitoriu in winter & spring 2015, between Italy, Switzerland, Germany, Belgium, France, during our Italian and European Tour. Edited by Elena Cabitza. Ecco il nuovo video di “Kerouac”, direttamente dal nostro ultimo lavoro “Truck Stop Ep”. Le immagini sono state riprese durante il nostro tour italiano ed europeo, tra l’inverno e la primavera 2015: Italia, Svizzera, Germania, Belgio, Francia. L’edit del video è di Elena Cabitza. Buona visione! We are very proud to announce our first european trip with our german friends from Limestone Whale. 5 Nations, 10 days, 10 gigs!